In September 2003, a mixed forest of central Portugal (Tapada Nacional de Mafra) burned in a large crown fire. 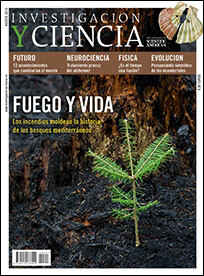 We surveyed the survival of more than 700 trees during 4 years postfire. The results are detailed in a recent paper by Catry et al. (2010, ) ; the table below provides a summary on the proportion of the trees that (a) died, (b) survived but were top-killed (stem and crown mortality) and resprouted from the base, and (c) the stem survived, after 4 years postfire (for tree mortality, the value observed after the first year is given in brackets). Most pines (P. pinaster and P. pinea) died and few, specially of P. pinea, were little affected by fire; there were a significant positive relationship between crown damage and tree mortality. Most broadleaved trees survived the fire, and whether the stem survived or died (and resprouted from the base) were related to bark thickness and char height (i.e. fire severity). Castanea sativa showed the highest tree mortality, mostly due to post-resprouting mortality after the first year. Fraxinus angustifolia, Olea europaea and Pistacea lentiscus showed no mortality at all; most Olea and Pistacea individuals resprout from the base, while for Fraxinus the crown of most trees were unaffected. The low effect of fire in Fraxinus angustifolia is probably due to the topographic positions where this species occurs; in addition theses trees are quite tall and with relatively thick bark. Quercus coccifera and Q. faginea showed low mortality and most trees resprouted from the base. Quercus suber showed almost no mortality and almost all trees showed epicormic resprouting, due to their extremely thick and insulating bark [2, 3]. [Update] see: “To resprout ot not to resprout”, Jan 25th, 2012.